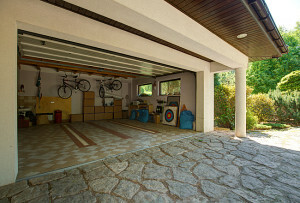 A smart garage doesn't just tackle the specific problems associated with garages. It also makes it simpler to enjoy the same security and convenience you thought was only practical in the main rooms of your house. Here's a rundown of some great options at your disposal. Remotely opening, shutting and even locking garages doors isn't new, but today's technology provides many advantages. If you connect a garage door to a home control system, you can set up many smart actions. For example, your phone could have an alert so you don't drive away without locking the garage door. You could set the action of opening the garage door as the trigger for other "arriving home" actions, such as automatically unlocking the front door, switching on lights and turning up the thermostat. Garages offer a double danger when it comes to cold conditions. They're particularly prone to cold temperatures by being at ground floor — usually with few shared walls — and often without permanent heating. To make things worse, homeowners usually don't visit the garage as often as other rooms, so it could be a while before you notice a problem. Having a freeze sensor in your garage means you'll be alerted right away if the temperature drops below zero. You can then switch on heating or bring in a portable heater to avoid problems such as burst pipes. Depending on your system, the alert could be on a touchscreen control or as a message on a smartphone app. You can set a flood sensor up similar to a freeze sensor, but this device measures moisture levels rather than temperature. Flood sensors alert you if pipes have burst, but can also be an early-warning system when external flooding has breached your property. Keeping a garage protected from floods is often low priority, so a flood sensor here could give you enough notice to protect other downstairs rooms, move valuables upstairs or get out of the home while it's still safe to do so. You'd be forgiven for thinking having a security camera inside a garage was overkill, leading to hours of wasted footage where nothing happens, but that's not the case with smart home systems. Using motion sensors, you can set up a system to only record when the garage door is open, if a window is breached or if the system detects movement in or around the garage. Unlike with old-fashioned video tape or local hard drive recording, a smart home security system can alert you when recording starts and let you immediately check if anything is amiss, no matter where you are. You can also access a lengthy archive of the footage. For example, you can check the past 30 days, providing evidence if you're unable to prevent a burglary. Having security footage from your garage could also speed up the claims process on your auto insurance after a theft. Taking advantage of smart garage technology will help you feel safer, while being aware of anything abnormal with this part of your home. This can be crucial in bad weather and other events. For more ideas and help with making the most of your garage through smart home technology, call the experts at Vivint today.